The Stargate at Ranmasu Uyana – Remnants of a Lost Civilization? Sandwiched between the Thissa Wewa reservoir and the Isurumuniya Rock Temple, RanmasuUyana of Anuradhapura, a forty acre pleasure garden of the ancient Sri Lankan royals is a unique creation. The Ranmasu Uyana was mainly known for its rock sculpted bathing ponds with a sophisticated hydraulics mechanism. A subtle use of pressure difference enables the pumping of water from the nearby Tissa Wewa to the swimming pools of the garden. The pools themselves display a clever use of technology and craftsmanship, in constructing a flawless luxury swimming facility nearly three thousand years ago. However the true wonder of RanmasuUyana is found among the rock boulders and caves away from the pools. Carved on a stone wall is a strange map like chart known to many as the ‘stargate’. A stargate is believed to be a gateway between the earth and the outer space, through which humans allegedly roamed the universe communicating and engaging with other intelligent beings in the universe. This chart is believed to be the secret code to accessing the stargate. 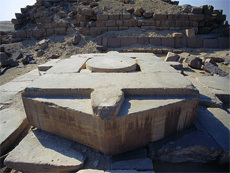 Facing the stargate marking are four seats, which implies that it was a chart, which could be used or manipulated by four individuals. The discovery of the stargate marking had created waves amidst archaeologists and pre-historic investigators, some drawing parallels between the stargate charts found in Abu Ghurab in Egypt and ‘the gate way to the gods’ in Peru. The bizarre coincidence of all the three marks been found in the vicinity of a water way, with sophisticated engineering methods, had given rise to various theories. The most favourite is the claim that these stargates were used by extraterrestrials that were gold mining in Earth. 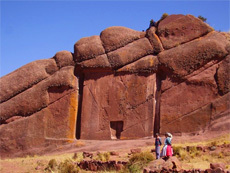 Their theory is built up on the fact that in 2400 BC the stargate in Abu Ghurab Egypt was surrounded by water while” La Puerta de HayuMarka.” Or “The Gateway to The Gods” in Peru too is built closer Lake Titicaca, with underground water tunnels and chambers beneath the pyramids. The advocates of the ‘processing gold from the waters of Earth’ theory believes that these water channels, chambers, reservoirs and filters found near each stargate to have been a part of a sophisticated mechanism developed by extraterrestrials thousands of years ago. If the theory is held to be true, RanmasuUyana had once been a ‘gold processing center of extraterrestrials’, which arrived on earth through stargates. Yet archaeologists are eager to discard these theories as pure imagination. According to the earliest archaeologists and historians the charts could have been a descriptive chart of the universe according to Buddhism or a simple map of the earth. At later stages the historians have interpreted them as descriptions of animal evolution or as the way Tantric Buddhist monks perceived the world. It is believed that they used them for meditation purposes as well. Present day archaeologist abhor the thought of comparing Egyptian civilisation with the Sri Lankan civilisation, insisting that ours is a unique island civilisation pure of Egyptian or Babylonian influence. 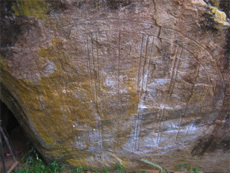 Whatever their initial use may have been, the interpretations provided for these markings varies from a secret key to space travelling to the floor plan of Sigiriya, a rock garden found closer to Anuradhapura. Yet the only fact about these charts is that despite various claims and arguments, we are nowhere near to understanding them or knowing their sources.